Hello all. I’m Christian. My mom, Bonnie, asked if I would do a special, guest post on her blog. I will never pass up a chance to ramble to an audience of people I don’t know. So, here goes. Back in 2012, I decided to redo my kitchen, myself. Mostly to update and change out some stuff. I consulted my mom for ideas of countertop surfaces. If only this wonderful blog had existed then! (Shameless plug). Well, I weighed the options and had two final contenders. Those being concrete and wood. I considered the pros and cons of each based upon reading numerous articles. I settled on wood. Edge grain walnut to be exact. I considered Maple first, however, the butcher block cut was far too pricey and the edge grain cut was too pale for my tastes. I looked at Acacia, Rubberwood, Cherry, and many more. 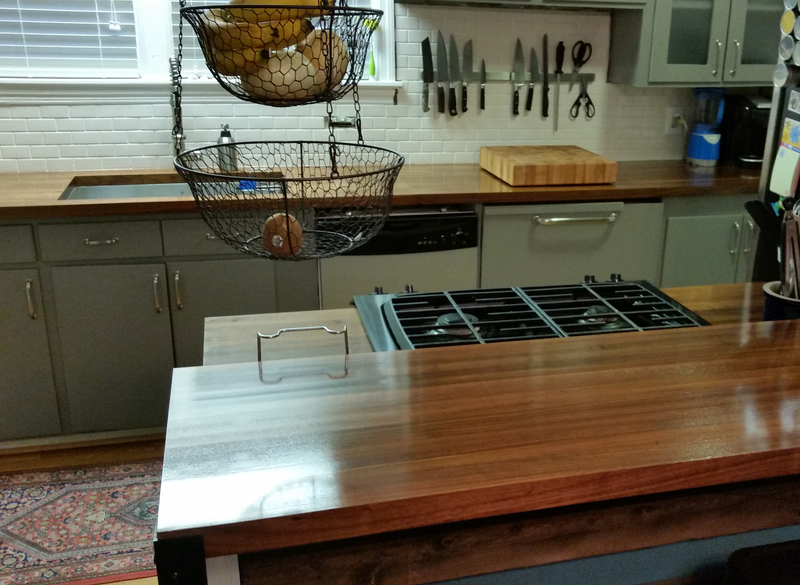 A word on edge grain and end grain: End grain is the butcher block look. Hundreds of squares of wood, glued and clamped together. This surface is hard, durable, and in many case doesn’t need to be sealed. It’s also 3-4 times more expensive than edge grain. Edge grain is made of long strips of wood in which the grain runs parallel to the length of the piece. Here’s some of the pros and cons I found while researching. 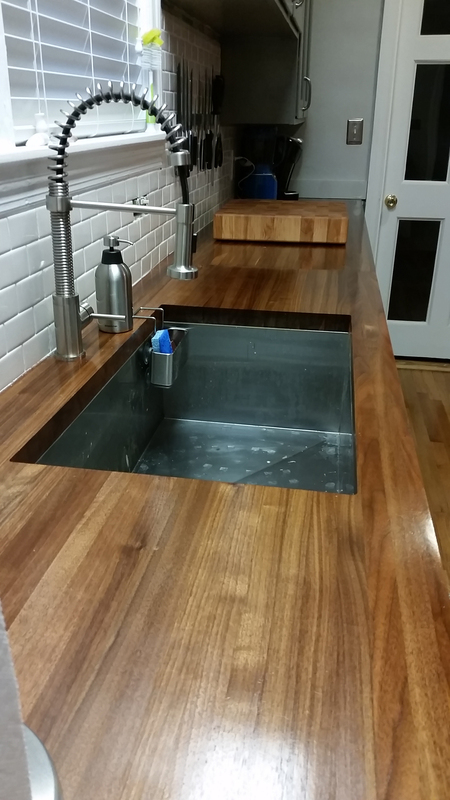 While I may be biased now that they’re installed, wood countertops are essentially peerless in terms of beauty. So, yeah. 1 pro to 8 cons. Luckily, I don’t work for the wood countertop advisory board. So, the first thing I asked myself was if the beauty and look was what I wanted. Given that I could have an A&E tv show dedicated to my desire to clean and that I have no children, I gave it a go. I was able to procure them from a dealer online and they were shipped direct to me. In 2 500lb sections. My ability to lie about my strength is immense, but even I had trouble with these monsters. I’m not going to go into the process of cutting, finishing, installing them because I was only asked to review wood countertops. If you’re interested in what that entailed, then maybe you could beg her to have me back. But I would imagine I’m going to do something to wear out my welcome before this article is over. Here they are all finished and installed. At the time of writing this, I’ve had them for close to 3 years. And amazingly, I haven’t had any big problems. Just a few minor scratches in the finish. In fact, I love them even more. I walk by and run my hand across them, feeling their fantastic smoothness. The bar top behind the stove. I do, however, take very good care of them. Careful not to drop full grocery bags, toss my keys, slide pots across them, always always (one more) always use a trivet of some kind with hot items, etc. The sealer product I used to finish them has been amazing. No water staining of any kind. And I was insane enough to have an undermount sink with wood countertops. Note the hanging basket: I defy you to find a better fruit than a fresh kiwi. Make no mistake, wood countertops are not easy. I clean them with diluted vinegar as to not fog the finish. Ammonia based cleaners like Windex can. I wipe up any spills or water immediately. I dry around the sink after each use. I never said I was a photographer. 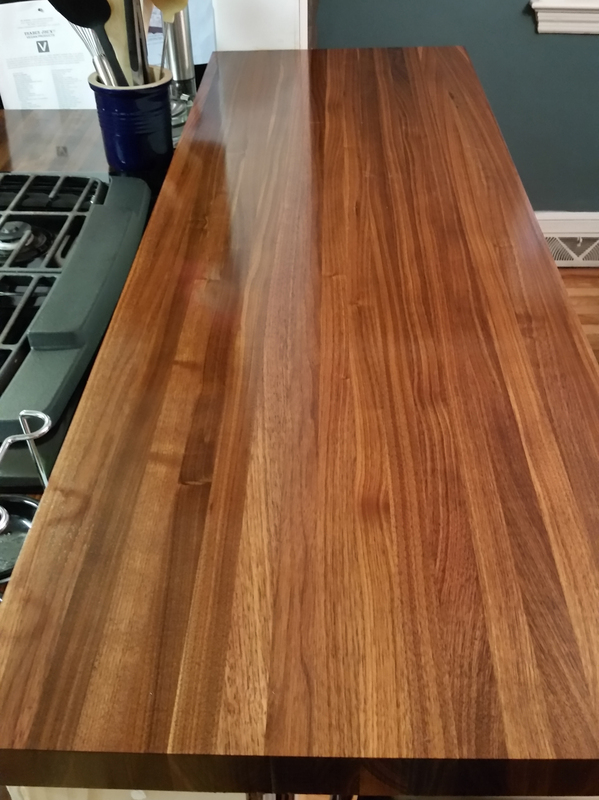 Are wood countertops worth the effort? Yes, if they’re worth the effort to you. That’s kind of a lame answer, yes. But I enjoy their beauty and find that worth the effort. I would not recommend them for those with kids. It’s not worth the stress. Nor would I recommend them for someone who isn’t all on board with the maintenance. But for those that want something that few people have, most people want, and everyone loves, I have to urge you to take the plunge. If properly installed and finished, they will only age and darken with time. And you’ll freaking love them. I’m planning to marry mine in a quiet ceremony on a beach in Maui. And wouldn’t you know, I’ve worn out my welcome. This entry was posted in Design Stories, Design Tips, Products and tagged Countertops, edge grain, end grain, Selecting the right countertop, walnut, wood countertops. Bookmark the permalink.